A friend's mother is about to celebrate her 65th birthday, and I created this box to house some photos (photos not currently pasted in). 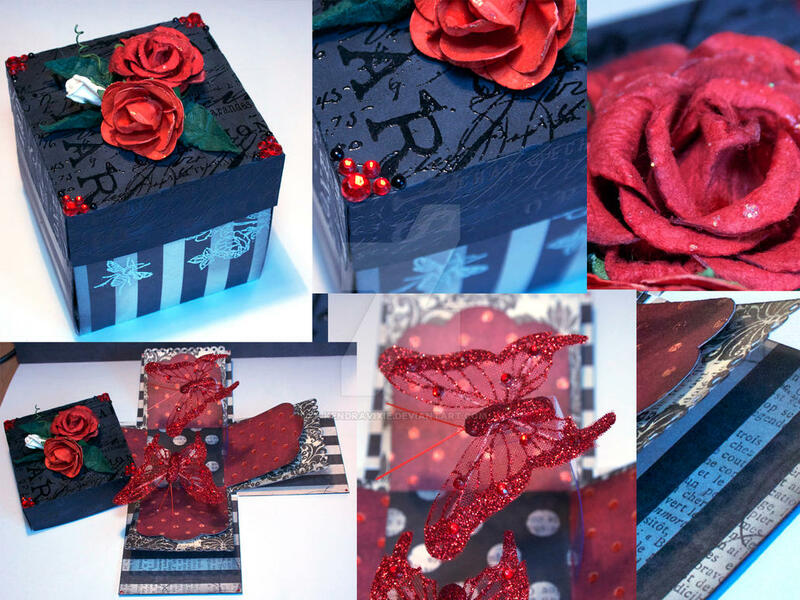 Box opens up to reveal butterflies on acetate so they appear "floating" in the box. The rhinestones are meant to look like cats' paws, as the photos inside the box will be of their pet cats. Shapes downloaded from the Silhouette America online store. Not shown: Happy birthday stamped greeting, personal photos of pets. Beautiful artwork! Congratulations on the DD! This is gorgeous! 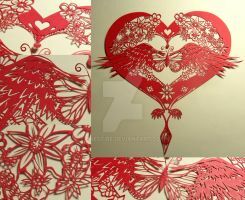 You did an original and very personal present for your friend's mother, she will be happy! Lucky you, I want a Cameo too!! Congrats on your DD, you deserved it! That's beautiful! You should totally sell these! The color red is so fancy~ I love how you mixed different pieces together to make them look really neat. 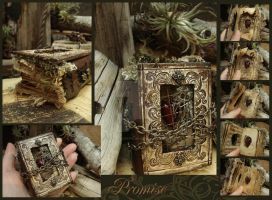 This is such a beautiful box, it should be on the market! This is really beautiful! I wish I can make something like that for my mom on mother's day... I hope your friends mom likes it! I'd love to get this as a gift; it's just breathtaking. I've never heard of an 'exploding box' before. This is so cool! The butterflies are a great idea. What a lovely birthday present! Many congratulations on the DD! What a beautiful and original idea! Love This! And congrats on the DD! Woaw, I love this !!! Oh wowww that is so creative!!!! Awesome - this is so unique! 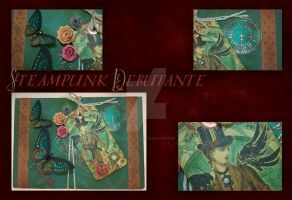 Love the paper that you used - the colors and textures are beautiful together! Aww, that's such a sweet and meaningful gift. Hard to come by those nowadays. Really love the textures and all the work you've put into this! I LOOOOVE IT!!!!! Congrats on the DD hun! well deserved!!! Beautiful. I love all the different textures you've used in this, its a very creative idea.